Manchester city flag options on the Nov. 7 ballot. QUESTION 1: How did this city flag contest come to be? SKELTON: The flag contest came to be when a resident of Manchester, who has an interest in flags and flag design, rallied together a committee of stakeholders to work together to take on the task of holding a contest. The process was then taken on by a devoted volunteer group that included the Greater Manchester Chamber of Commerce, the NH Institute of Art, the Manchester Arts Commission and the Manchester Historic Association. After much research into contests other cities have held, and with the “5 basic rules for good flag design,” in mind, a contest was born! In June, a panel of judges narrowed 300 entries down to 3 finalists that all have ties to Manchester. Entries were submitted from individuals all over the world, to middle school students from Manchester classrooms. The entire process encouraged community involvement and civic engagement – with the hope that a flag design will be adopted that becomes a source of Manchester pride. QUESTION 2: What’s wrong with the current flag, which is the seal and the Labor Vincit (“Work Conquers All”) Latin phrase? SKELTON: There is nothing wrong with the fact that our current city seal is flying on a white flag. No matter which flag design is chosen, Manchester’s city seal will not change. This contest was a way to increase the functionality and visibility of the city flag, not to disrespect the seal in any way. A new flag would complement the seal rather than replace it! A first-ever, official flag will serve as a tool that will share the story about the history and the future of Manchester to those throughout the state of New Hampshire and beyond! QUESTION 3: What happens after Nov. 7? Voters choose one option by a majority. Then what? 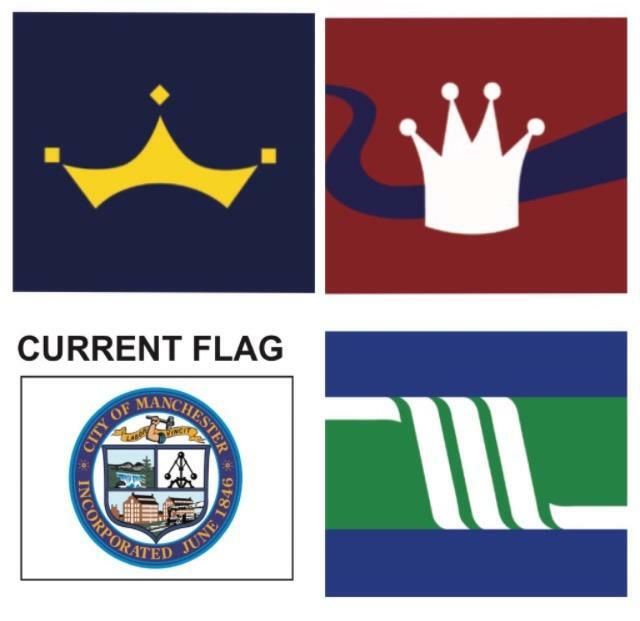 SKELTON: On November 7, a supplemental color ballot will be provided for city residents to select a flag design they think best represents Manchester. After the majority selects a flag, the Board of Mayor and Aldermen (BMA) do retain the right to make a final selection. The flag contest was a locally-generated, non-political exercise in civic engagement and the final designs all have familiar Manchester symbolisms in their designs. It is the hope of the volunteer group working on this project that the BMA will adopt and implement the design chosen by the residents of Manchester to complement our current city seal. Voters in Manchester will see two ballot questions on Tuesday. One is something on the ballot in ten other cities this Election Day, a variation of: Shall the city allow the operation of Keno games within the city? "Which flag would you like to see as the official flag of the city of Manchester?" You’d be forgiven for not being able to draw Laconia’s official city flag from memory. It doesn’t actually fly anywhere, so even most residents have never seen it. But an effort to redesign and reinvigorate the city flag is underway, and not everyone is happy about it.